The purpose of this project is to develop a virtual reality game that support individuals with Mild Cognitive Impairment (MCI) to participate in physical activity. Physical activity has many benefits for people living with dementia such as improving mood and health. People are more likely to participate in physical activity when they have some instruction, for example, a person or a video. Virtual Reality technology can be used to provide this guidance as well. 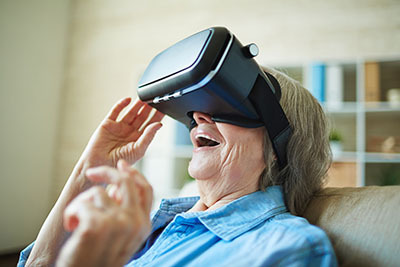 The purpose of this project is to see how Virtual Reality technology can be used in retirement living to encourage people with Mild Cognitive Impairment (MCI) to participate in physical activity. The researchers worked with team members and retirement residents to design a program and try it out with volunteers. All participants enjoyed the program and gave very positive feedback. They also helped provide ideas to improve the program. The research team is working on making improvements with hopes the program may be a useful tool to increase physical activity levels in people living with MCI.